Consider this: a new perspective, a different lens—one you haven't entertained yet and maybe never will without being provoked. That's what the artists did in the featured reviews below. From the drastic differences between winter's beauty and peril, to an interpretation of a woman's emotional journey, to a day in the life of a nose trotting around Russia in 1835, these artists breached the comfort zone of their own perspective and forced themselves to consider a new angle for a change. The results? Well, see for yourself. 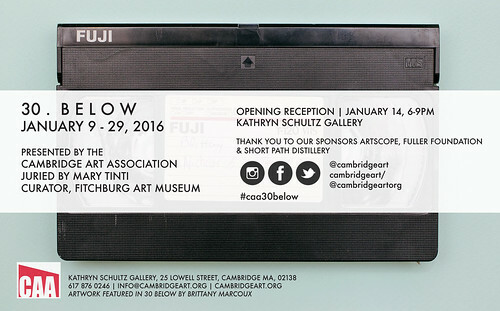 If you're looking for something to do tonight, Cambridge Arts Association is holding the opening reception for 30 Below, their newest exhibition, from 6 - 9 p.m. at Kathryn Schultz Gallery. 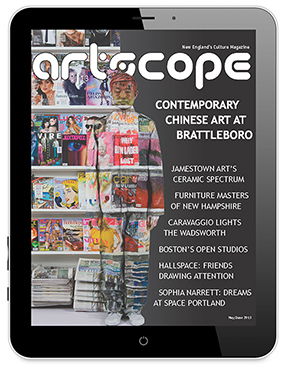 If by chance you'll be out of town next week, Artscope is helping to sponsor Art Palm Beach in West Palm Beach, Florida. Also of note: Our March/April 10th Anniversary issue is fast approaching! Please contact us if you are interesting in advertising in the issue. 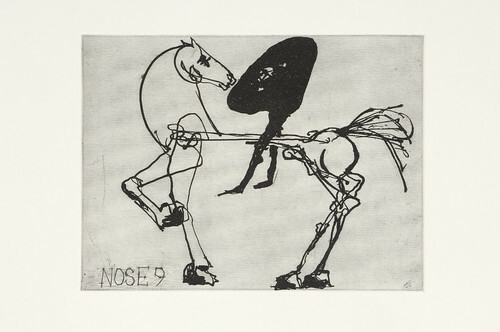 Nose 9 by William Kentridge, Sugarlift aquatint and engraving. Imagination is exploited to the fullest in the current exhibition at the Center for Contemporary Printmaking. William Kentridge: The Nose Series is an exhibition of 30 prints by world-renowned artist and South African native William Kentridge. The exhibition is on loan from David Krut Projects, an arts, design and projects gallery space in Johannesburg, Cape Town and Chelsea, New York. At the end of 2006, David Krut Projects began its collaboration with William Kentridge on his elaboration of the Shostakovich opera The Nose, commissioned by the Metropolitan Opera in New York, which premiered in March 2010. The opera is based on The Nose, a satirical short story by Nikolai Gogol written between 1835 and 1836 and tells the absurdist tale of a St. Petersburg official whose nose leaves his face and develops a life of its own. The prints in The Nose Series showcase Kentridge's imagined journey that illuminates the Russian experience at the time. The artist explores a number of techniques throughout the series, though he relies mostly on his trademark: strong, drypoint marks softened by sugarlift acquaint and punctuated in several places by a strong Constructivist red. Each plate is engraved with its number in the series. Center for Contemporary Printmaking Executive Director Laura G. Einstein expressed the Center's eagerness to host the series. "To exhibit this singular artist, William Kentridge, who had garnered acclaim as an artist, printmaker and director is wildly exciting," says Einstein. "We are grateful to David Krut for continuing a relationship with CCP that began years ago and for loaning to us works by this creative genius." William Kentridge: The Nose Series is on view now through Saturday, March 19 at the Center for Contemporary Printmaking. 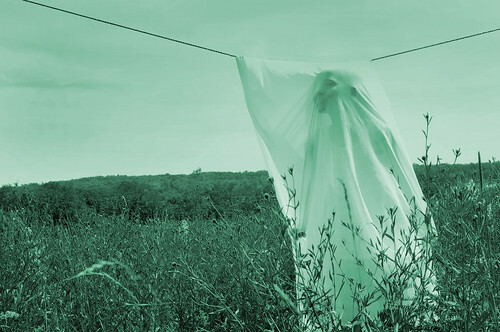 Two events in connection with the Kentridge exhibition have been planned by the Center. On Thursday, February 11, Mezzo-Soprano Wendy Gerbier will perform operatic selections from 6 - 8 p.m. This event is free and open to the public. Play With Your Food, an award-winning performance troupe based in Fairfield, Greenwich and Westport, will present Political Meets Theatrical: Staged Readings from the Edge on Sunday, March 6 from 4 - 6 p.m. Tickets should be reserved by Friday, February 26. 30 Below Juried by Mary Tinti, January 9 - 29, 2016. Opening reception Thursday January 14th at the Kathryn Schultz Gallery, 6-9pm sponsored by Short Path Distillery. 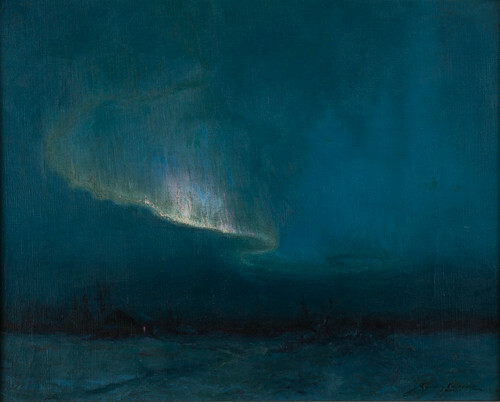 The Northern Lights by Sydney M. Laurence, 1926, oil on canvas. To anyone who has spent a winter in the Northeast, the season can be dark, cold and dismal, yet at the same time peaceful, serene and breathtaking. Both ends of this spectrum meet in the middle in the upcoming exhibition at Shelburne Museum, 32°: The Art of Winter. Featuring works in many mediums dating from the nineteenth century to the present, this show aims to expose the plethora of appearances, emotions and associations winter has to offer. In the first sub-section, snow and ice are broken down and studied in their most simple visual forms, focusing on their variances in form, scale, tonality and light. The second section hones in on the physicality of wintery elements and the sensory responses they evoke, including sound and sporadic movements. The final section in 32°: The Art of Winter explores the personal associations and relationships developed from snow and ice. Frigid temperatures and slick surfaces often trigger moments of nostalgia and memory beyond our most conscious recollections. This exhibition also includes some temporary features, including the exquisite "Snow Drawings" of reclaimed artist Sonja Hinrichsen, as well as a monumental, whimsical snow sculpture by the Vermont Snow Sculpting Team. Additionally, three local architectural firms will be displaying architectural follies based off of the forms and functions of ice shanties in "ARCTICtecture: An Ice Shanty Project." Come celebrate winter and all its tragically beautiful qualities in 32°: The Art of Winter, on view Saturday, January 23 through Monday, May 30 at Shelburne Museum. Saturday, February 27 will be the exhibition's Family Day where the Vermont Snow Sculpting Team will create a snow sculpture and the" ARCTICtecture: An Ice Shanty Project" will be revealed. Featured work by Erik Hansen. New photography work by Erik Hansen has made its debut at Maynard's 6 Bridges Gallery. She Learned to Smile Later, the culmination of five years' work, is a photographic novella of a therapeutic journey that starts in adversity and ends in triumph. The narrative begins with representations of trauma and violence, evoking a sense of fear and heightened awareness from the viewer. The story progresses through each frame and the darkness eventually dissipates to make room for visual metaphors of newly found strength, hope and clarity. Though much of this work is about the images and lighting and the emotional beauty they create, the images also include studio and outdoor shots, silhouette and costume construction, hand-drawn images and glyphs, scaled models, Photoshop blending and even found objects from antique shops. She Learned to Smile Later is somewhat of a departure for Hansen, veering from his characteristic black-and-white palette and incorporating color as a narrative for the young woman's journey. Of his work, the artist says, "I am interested in art that brings something from the inside out, rather than making observations of the outside world. It's a process that demands a deep exploration of states of mind, mystery and mythology." Hansen grew up in Manhattan suburbs, where he attended Rutgers University studying art and history. Today, he has a studio at ArtSpace Maynard. She Learned to Smile Later is on view at 6 Bridges Gallery now through Saturday, February 13. An artist reception will be held this weekend on Saturday, January 16 from 6 - 9 p.m. at the gallery. For the creative bride. Sip a glass of champagne, view the museum's majestic venue on Porter's Pond, and meet over 25 vendors. 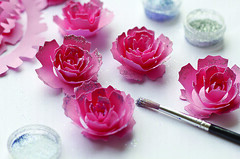 Creative bachelorette party ideas. Swag bag. From 1:00 - 3:00 pm. Emerging designer Cynthia Gu showcases lovely sustainable wedding gown.